Language*: Dougald A. MacFarlane spoke Scotch Gaelic. Biography*: The 1881 Census lists Dougald as a mill wright. He and his family were living with his father at the time of the 1881 Census. The 1891 Census lists Dougald as a farmer who could both read and write. He is also listed as a wage earner. The family lived in a one and a half story eight room wooden house. The 1901 Census says that Dougald could both read and write in English, but not French. Dougald was the last surviving sibling and last surviving member of the first Municipal Council that sat at Port Hood. He was well posted in history, particularly the history of Scotland. He was a Justice of the Peace. [S25] April 13, 1891 Canada Federal Census, 101 Newbury Street, Boston, Suffolk, Massachusetts, USA. [S616] Marriages Registered in Nova Scotia, Inverness County 1864-1877: #2. [S100] Obituaries from The Casket Newspaper, 1852 - present, Obituary of Dougald MacFarlane 85-1937-3-2. Daughter of Angus Gillis Southwest Margaree. Biography*: The 1901 Census says that Mary Ann could both read and write in English, but not French. [S100] Obituaries from The Casket Newspaper, 1852 - present, Obituary of Mrs. Dougald A. MacFarlane, 78-1930-40-2. No doubt you have heard before now of the death of your husband No. 877981 (?) Pte. MacFarlane, A. J. who was killed in action on August 13, 1917, during an attack on Lens. Death*: Angus died before 26 August 1930 in SW Margaree, Inverness, Nova Scotia, Canada. Language*: Mary A. Cameron spoke Scotch Gaelic. 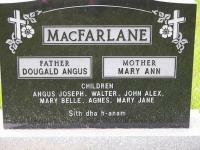 Married Name: As of 20 February 1887,her married name was MacFarlane. Biography*: According to the 1891 Census Mary could both read and write. She was widowed and living with her husband's parents at the time of the census, listed as a general servant. The 1901 Census says that Mary could both read and write in English, but not French. Her native tongue was Gaelic. She was still living with her husband's parents. [S100] Obituaries from The Casket Newspaper, 1852 - present, Obituary of Mrs. Dougald MacFarlane (Mary), 86-1938-51-2. Language*: Mary MacDonnell spoke Scotch Gaelic. [S100] Obituaries from The Casket Newspaper, 1852 - present, Obituary of Joseph A. MacFarlane, 101-1953-32-5. Language*: Joseph Allan MacFarlane spoke Scotch Gaelic. There passed away, peacefully from this earthly scene another of this community's oldest, most respected citizens in the person of Joseph A. MacFarlane, aged 73. His death occurred at his home at Southwest Margaree Friday night January 9th, 1953. While he was partaking of his evening meal he was suddenly stricken with a paralytic stroke and death ensued around midnight. Last rites given by Rev. D.F. Roberts and Dr. B.L. Steele of Inverness was there. 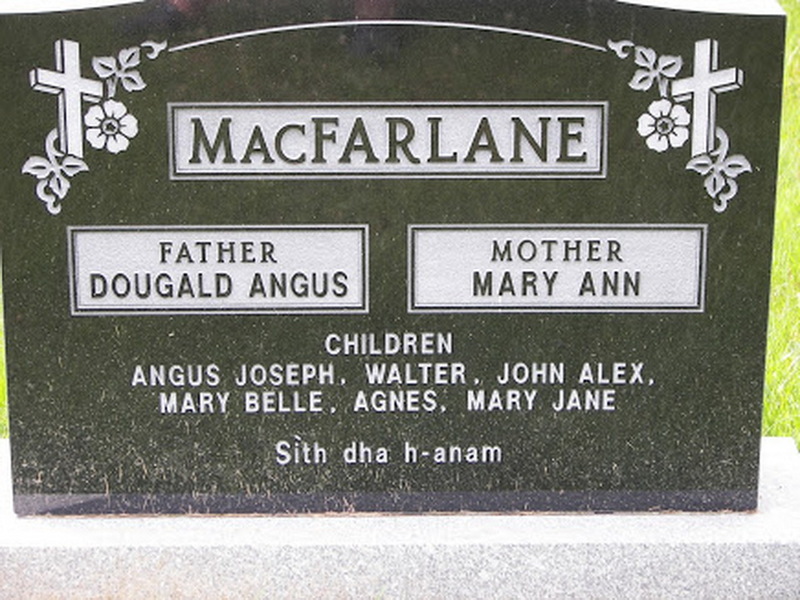 The late Mr. MacFarlane was born at S.W. Margaree on November 7, 1879, son of the late John MacFarlane (Malcolm's son) and Mary MacDonell (Allan's daughter). He was married on February 17, 1903 to Margaret MacIntyre of Cape Mabou, C.B. who survives him. Had he lived until February 17th of this year they would be observing the jubilee of marriage. Biography*: According to the 1891 Census Joseph could both read and write. The 1901 Census says that Joseph could both read and write in English, but not French. His native tongue was Gaelic. He is listed as a farmer's son. [S9] Births, Church Record, June 1977 to September 1944 St. Joseph's Church, Margaree, Records, page 6, line 5. [S100] Obituaries from The Casket Newspaper, 1852 - present, Obituary of Mrs. Joseph A. MacFarlane, 103-1955-42-3. [S709] Diocese of Antigonish, Nova Scotia, Canada , Marriage record of Joseph McFarlane and Margaret McIntyre, page 128. Married Name: As of before 1953,her married name was MacKenzie. Our dear precious mother, surrounded by the loving embrace of her devoted family, passed into the arms of our Blessed Lord on Ascension Sunday, June 5, 2011. Our kind gentle mother, Catherine, was the daughter of the late Joseph and Margaret (Mac Intyre) Mac Farlane of South West Margaree. Born on June 7, 1917 she was destined to celebrate her 94th birthday in Heaven with the Church Triumphant. She was the last surviving member of her immediate family.She was predeceased by her husband Frank on Oct. 26, 1971; her son Robert on Nov. 26, 2004; and her son Gerard on April 22, 2011 (44 days earlier). She was also predeceased by her brothers Archie (Sadie) - Sydney, Malcolm - South West Margaree, Dan (Liz) - Kentville, and Jimmy (in infancy), and by her sister Margaret (Barney) Ficociello - Woburn, MA. She is survived by her four children -Anne (Elmer) Syms, Joseph Mac Kenzie, Mary (Peter) Bren, and Hector (Meryl) Mac Kenzie and daughters-in-law - Lorene Mac Kenzie and Mary Mac Kenzie. 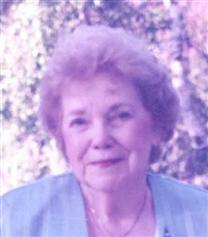 She is also survived by 16 grandchildren, 32 great-grandchildren, and one great-great-granddaughter. Ma, a lady of great faith and devotion to Our Lord and His Blessed Mother, was a member of the Catholic Women's League for approximately 50 years. As a lady of grace and dignity she was also a staunch supporter of the Gaelic culture being a fluent speaker, writer, and reader of the language. In 1973 she graduated from Xavier College with a diploma in Gaelic teaching, a certification put to use in the education of many young people in the Gaelic language. She was also a strong supporter of the Gaelic society and an active member of the Gaelic choir at its inception and for several years thereafter. [S9] Births, Church Record, June 1977 to September 1944 St. Joseph's Church, Margaree, Records, page 58, line 24. Married Name: Her married name was Ficicello. Name-Comm: His common name was Dan A. Language*: John A. MacFarlane spoke Scotch Gaelic. Biography*: According to the 1891 Census John could both read and write. The 1901 Census says that John could both read and write in English, but not French. His native tongue was Gaelic. He is listed as a farmer's son. [S9] Births, Church Record, June 1977 to September 1944 St. Joseph's Church, Margaree, Records, page 2, line 19. [S954] 1911 Canada Census, MacFarlane # 1885. Language*: Alexander MacFarlane spoke Scotch Gaelic. Biography*: The 1881 Census lists Alex as going to school. According to the 1891 Census Sandy was a farmer who could both read and write. The 1901 Census says that Sandy could both read and write in English, but not French. His native tongue was Gaelic. He was listed as a farmer's son. Sandy was living in Gillisdale, C.B. at the time of his brother Joseph A. 's death in 1953. [S506] Robert Joseph Gillis, Two Gillis Families, page 153. Married Name: Her married name was MacIntyre. [S738] Dennis Ryan, "Descendants of Hugh McKinnon, Jr.", page 4. [S738] Dennis Ryan, "Descendants of Hugh McKinnon, Jr.", page 2.